Sweeping grassland vistas, spectacular cliffs and canyons, cool, dry forests, secret ponds and small lakes await the visitor to the newest grasslands protected area in the province. It rises north and westward from the hot, dry Thompson valleys through three grassland communities to the forested hills above. Nowhere else in western North America will you find these grassland communities in such close proximity to each other. Special Feature: This protected area fulfils a very important conservation role in representing the Thompson Basin and Northern Thompson Uplands Ecosections. This protected area contains complex geology, a mixture of grasslands and forest types, a highly differential set of topographical features and soils and a variety of cultural uses combining to produce an area of notable diversity. Spring comes early to the lower hot, dry slopes with plants responding to the short, moist season. In contrast, the upper grasslands and forests are not in full bloom until early June when brilliant balsamroot followed by brown-eyed susan wash the hillsides. Beyond the grasslands, ancient ponderosa pines in a sea of bluebunch wheatgrass give way to groves of trembling aspen and stands of Douglas fir, some of which are believed to be over 400 years old. California bighorn sheep, mule deer, black bear and waterfowl are common residents and visitors to the protected area, while the Northern Pacific rattlesnake, sharp-tailed grouse and flammulated owl live more secretive lives within its boundaries. Lac du Bois Grasslands Protected Area is your protected area. We hope you will visit it often and enjoy the values for which it was established. BC Parks is looking to the local community and other users for their support in managing this fragile area. Rattlesnakes are one of the many endangered species in this protected area. They are seldom seen, but if encountered, they should be left alone and bypassed. Bring your own drinking water, as potable water is not available in this protected area. Although it is very warm in the valley, it can be much cooler higher up in the hills. If hiking, carry appropriate clothing and rain gear. The use of ATVs and 4-wheel drives are strictly prohibited in the protected area. They are, however, permitted in the designated ATV area located outside of the protected area, to the south. Parking opportunities are limited on all roads in the protected area. Pull well off the traveled portion of the road, and lock your vehicle. Some roads are closed to vehicle traffic. Main roads are Highway designated roads on which the Motor vehicle Act applies. Long Lake road is a seasonal road and may be closed for extended periods during the spring due to breakup. Permits and/or authorization must be obtained from BC Parks for most activities in Lac du Bois Grasslands protected area. The area is so sensitive to disturbance that it is important to remind visitors that people who disregard the Park Act or regulations can face heavy penalties. In 2008 the Nature Conservancy of Canada (NCC) purchased 2,342 acres (948 hectares) of private land located within and around the Lac Du Bois Grasslands Protected Area. These Conservation Lands contain some of the most intact native grassland in BC, and support numerous species at risk. These lands remain private, but access is permitted for low-impact recreational use. Camping, off-road vehicle use, and campfires are prohibited. Obey all posted signs. Other privately owned parcels of land exist within the protected area, which require the owner’s permission to travel through or carry out any activities on. A: Lac du Bois Road in the east takes the visitor through the full sweep of the grasslands. From the intersection of Fortune Drive and Tranquille Road, take 8th Street north through two sets of traffic lights. At the overpass, move into the left-hand lane and turn straight ahead up the hill between the subdivisions. At the cattle guard the surface changes to gravel and is a good, but narrow, well-traveled road. Expect to meet logging trucks and school buses. B: In the west, Tranquille-Criss Creek Forest Service Road (also known as Red Lake Road) rises steeply to the Dewdrop Range and the deep canyon of Tranquille Valley. From the intersection of Fortune Drive and Tranquille Road, follow Tranquille Road past the airport towards Tranquille. Turn right over the railway tracks and around the fields before crossing the Tranquille River and going up the long, gradual hill. At the sharp blind 180 degree turn, there are two choices: go straight ahead to Dewdrop Flats and the red lava cliffs of Dewdrop Range; or go around the corner and up the hill to follow the spectacular Tranquille canyon. Expect to meet logging trucks and other local traffic. Long Lake Road: From the ATV area on the Lac du Bois Road, Long Lake Road winds its way through the grasslands to the forests past rolling hills and small ponds. It is a narrow, dirt track, steep in places; closed during winter and spring break-up or during adverse conditions that would affect the stability of the road. Dairy Creek Road: To get to the north edge of the protected area, take this logging road that runs through Douglas fir forest and beside deeply entrenched streams. It can be reached by following Westsyde Road. It is a narrow, gravel road steep in places; an alternative route when weather conditions permit. It connects to the north end of the Long Lake Road and eventually connects to the Lac du Bois Road. There are many junctions along the way so a good map is essential. The road lying to the west of Wheeler Mountain is deeply rutted and partly washed out in places. It is not recommended for public use. Vehicle access is limited to only those roads shown on the map; all other trails are closed to motorized vehicles. Not all roads are passable by two-wheel drive, low-clearance vehicles and weather conditions may severely change driving conditions. 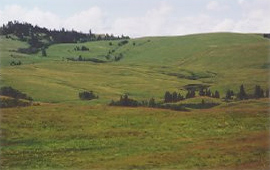 History: Lac du Bois Grasslands protected area was established in 1996. Cultural Heritage: Cattle are part of the history, and the culture, of the protected area. Horses of the Hudson’s Bay Company roamed the area in the 1860’s and cows grazed in large numbers as the beef industry expanded in the early decades of the century. Sheep in large flocks were over-wintered in the 1940’s before being taken to summer pastures west of the Fraser River. All these activities took their toll on the fragile grassland communities. A fenced pasture rotation system was put in place in 1977 that controls how cattle use the grasslands. This has lead to a marked improvement in the condition of the grasslands. Cattle are a part of the history and culture of Lac du Bois. Remember that range cattle are easily disturbed – view them from a distance and do not harass them. Historical hunting and root gathering activities and historically significant pictographs and archaeological sites confirm traditional native use of the area. There are signs of early mining activity along Kamloops Lake, Bachelor Hill and gold panning on lower Tranquille Canyon. Also, historic homesteading sites are evidenced in the protected area. Conservation: Two Ecological Reserves are found within the boundaries of the protected area. McQueen Creek in the northeast protects a representative example of the middle grassland community. Tranquille in the west protects a small area of ponderosa pine, Douglas-fir community. Ecological Reserves are areas set aside for their special scientific research and educational significance as representative examples of the many different ecosystems found throughout the province. Fences have been put up to keep cattle out of the reserves and maintain their natural condition. A permit is needed to visit these special areas. Wildlife: Species of note include California bighorn sheep, white tail and mule deer, moose, waterfowl, rattlesnake, sharp-tail grouse, flammulated owls, black bear, burrowing owls, western long-billed curlews, harriers, and waterfowl. Here are details on a few species at risk: sharp-tail grouse [PDF 5.66MB], rattlesnake [PDF 11.88MB] and the Western long-billed curlew [PDF 15.41MB]. BC Parks is in the process of developing a management plan for Lac du Bois Grasslands. Bicycles must keep to roadways. Bicycle helmets are mandatory in British Columbia. Mountain bikes and other cyclists must keep on established trails and not take short cuts. Be aware that bikes do have an impact, and watch out for others on the trails. There are rainbow trout in Deep Lake. Anyone fishing or angling in British Columbia must have an appropriate licence. There are countless opportunities for exploring the protected area on foot, whether for any easy stroll through the grasslands or a strenuous day hike in the hills. Most trails do not have any signs, so a good map is essential. For your own safety and the preservation of the protected area, obey posted signs and keep to designated trails. Shortcutting trails destroys plant life and soil structure. Pets/domestic animals must be on a leash at all times and are not allowed in beach areas or protected area buildings. You are responsible for their behaviour and must dispose of their excrement. Backcountry areas are not suitable for dogs or other pets due to wildlife issues and the potential for problems with bears. There is no viewing platform but there are excellent wildlife viewing opportunities and many beautiful vistas to enjoy. Viewing opportunities include the potholes, lakes and ponds on the grasslands for viewing migrating and nesting waterfowl and other wetland wildlife. California bighorn sheep and mule deer can be observed at the Dewdrop cliffs. Snowshoeing provides a way to experience the protected area in the winter – no designated trails. There are no maintained cross-country ski trails. Campfires are only permitted at the Watching Creek campground. No firewood is available and no fire rings are installed. If a campfire is used, please keep it small, and ensure it is completely out before you leave. Only wood that is dead and lying on the ground can be used for campfires. Camp stoves are recommended for cooking. Check for campfire bans before entering the protected area. Wilderness, backcountry or walk-in camping is allowed, but no facilities are provided. There is a small, rustic user-maintained wilderness campsite on Watching Creek, off Red Lake Road. There are Ministry of Forests, Lands & Natural Resource Operations Recreation Sites just north of the protected area at Isobel Lake and Pass Lake.